Professor Hafezi studied for two years at Sharif University before completing his undergraduate degree in Physics from École Polytechnique. He received his Ph.D. in Physics from Harvard University in 2009. He was a senior research associate at the Joint Quantum Institute before joining the ECE faculty. Researchers have demonstrated a new approach that enables different devices to repeatedly emit nearly identical single photons. Scientists have suggested a way to make electrons in graphene take on entirely new quantum behaviors. 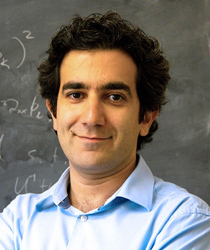 Dr. Hafezi’s award will support research for a Cryogenic System for Quantum Optical Measurement. Hafezi and Munday both hold affiliate appointments in the Institute for Research in Electronics and Applied Physics (IREAP). The Office of Naval Research awarded Hafezi for three years in support of his research on nanostructures. Hafezi is first Clark School faculty member to receive Sloan Foundation recognition.